This DIY is totally inspired by a Youtube video I saw just a couple of days ago, DIY Tumblr Pins Using Things You ALREADY Have by JENerationsDIY. The video popped up in the recommended when I was thinking hard about what easy DIY I can bring you guys this week. Perfect timing! The DIFFERENCE is I didn't use the #6 type plastic I can probably find somewhere in the recycle bin.. During the research, I found out bloggers talking about baking #6 type plastic gives off FUME! I do use the conventional oven for cooking food so I'm not taking any chances to create dangerous chemicals in the oven. I went to Michael's and bought the Shrinky Dinks sheets. It only costs $4 for 10 sheets. Before you jump into the tutorial video, I want to share with you some Fails and semi-fails. This is the name tag I made for my daughter for her AWANA vest. I traced the brown bear image from her AWANA textbook and colored in brown. It was cute and I can see the details of the cubbie bear's eyes, nose and mouth (and its smile of course). After baking the piece, the color got so concentrated. The name turned out really great though. I traced this Easter egg image from my doodle practice. I follow the wonderful DOODLES by SARAH on Youtube. The Easter/spring doodle is my Doodle with Sarah practice. I tried to have three eggs and the piece was quite long horizontally. The plastic piece sticked to itself(the one below) when I baked it in the overn. I was able to reheat it and pull it apart but the color got all messed up. The upper one I just drew two eggs and it turned out just fine. Now without further due, here is the tutorial. If you want the color to pop out a little bit more or you don't want see the metal pin from the front, you can paint the back side of the plastic piece white using acrylic paint. This is totally optional. Here is a picture of comparison. If you want make plastics charms or earrings don't forget to punch a hole in the original piece before sending it to oven. 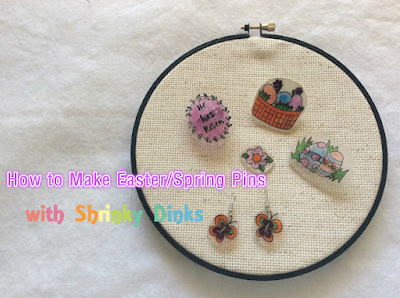 I can see so many possibilities in the future Shrinky Dinks projects. Make a successful name tag, charm bracelet, cactus pins, etc. Please give it a try. If you have tried before please let me know what you made. Leave me a link so I can go check it out.